وارسته مرادی٭, حسین. (1390). مدل سازی ارجحیت زیستگاهی دارکوب خال دار کوچک در فصل تولیدمثلی و غیر تولیدمثلی در پارک ملی گلستان. 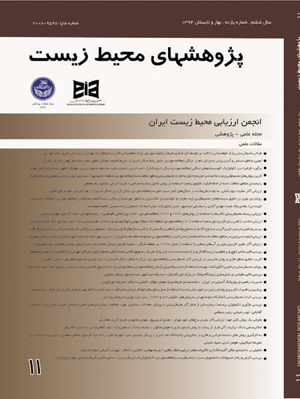 پژوهش های محیط زیست, 2(4), 1-10. حسین وارسته مرادی٭. "مدل سازی ارجحیت زیستگاهی دارکوب خال دار کوچک در فصل تولیدمثلی و غیر تولیدمثلی در پارک ملی گلستان". پژوهش های محیط زیست, 2, 4, 1390, 1-10. وارسته مرادی٭, حسین. (1390). 'مدل سازی ارجحیت زیستگاهی دارکوب خال دار کوچک در فصل تولیدمثلی و غیر تولیدمثلی در پارک ملی گلستان', پژوهش های محیط زیست, 2(4), pp. 1-10. وارسته مرادی٭, حسین. مدل سازی ارجحیت زیستگاهی دارکوب خال دار کوچک در فصل تولیدمثلی و غیر تولیدمثلی در پارک ملی گلستان. پژوهش های محیط زیست, 1390; 2(4): 1-10. Lesser spotted woodpecker is one of the most important and as an umbrella species in Golestan National Park. Classification tree models were applied to explore the relationship of the occurrence of this woodpecker and habitat variables between two contrasting periods (breeding vs. nonbreeding seasons) and for the entire annual cycle. During the reproductive period the availability of mature trees (DBH > 40 cm), and snags (dead trees), for nesting and roosting, characterize the breeding territory. Outside the breeding season the choice of locations was driven by a tree cover larger than 35% and the presence of trees taller than 7 m. Overall, during the annual cycle, welldeveloped canopy sites influenced the presence of this picidae (tree cover > 40%) and on more open sites (<40%) the presence of mature trees (DBH> 40 cm) became the second most important predictor of occurrence. The abundance and availability of food could be the ultimate factor explaining the seasonal variation observed, with the availability of snags being an important factor during nesting time. It is recommended to minimize the elimination of snags, and to harvest some large trees if the priority is to expand the distributional range of the woodpecker.